Staff selection commission(SSC) has been published recruitment calendar for 2017-18. 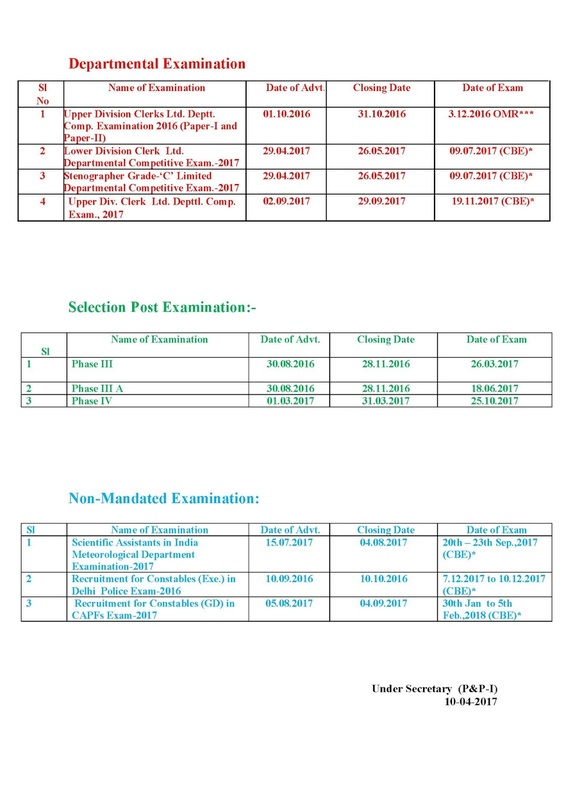 SSC will conduct exams for various type of posts in this year. SSC recruitment calendar 2017-18 consist notification releasing date, Application starting date, Last date of application and exam dates.Yearly Staff section commission is giving notifications for Combined graduate level(CGL), CHSL, Junior engineer, CAPF jobs and defense jobs. Just look at SSC CGL Revised dates, go to home page of SSC Recruitment. CHSL Tier 2 exam date: June 25th 2K17. Stenographer Grade C : July 9, 2017. CGL Tier 1 2017: August 1 to August 20, 2017. Stenographer Grade’C & D: Sep 4 to 7 2017. SSC Delhi Police Exam date Paper-2: October 8 2017. Exam for Selection Posts (Phase 4): October 25th, 2017. Combined Graduate Level Examination Tier 2: November 10 to 11 2017. SSC UDC clerk: 11/19 2017. MTS paper 2: December 17 2017. SSC GD Constable in capf : Jan 30- Feb 5th 2018. CGL Tier 4 Skill Test Exam: 2nd month of 2018. CHSL TIER I 2017: 3/20 to 4/20/2018. CHSL Tier 2 2017: June 24, 2018. For more details about SSC recruitment Calendar 2017 Syllabus, Examination type please visit SSC official website ssc.nic.in.